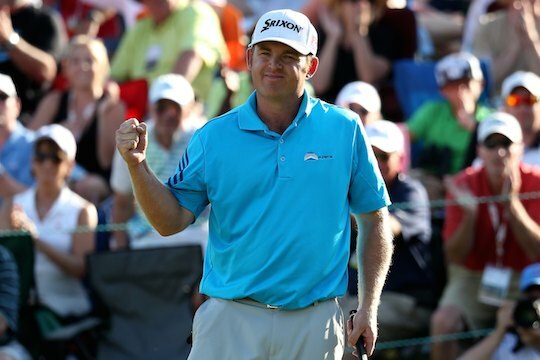 J.B. Holmes had to outlast a few major champions and hold his nerve on the way to a one stroke win at the Wells Fargo Championship on Sunday. Holmes’ 3-foot bogey putt on the final hole gave him a 1-under 71 and a one-shot victory over Furyk, after Holmes had dropped shots during the closing nine in a tense finish. Still searching for his first PGA Tour win since the 2010 Tour Championship, Furyk might not have walked away with the trophy, but his final round 65 was good enough to at least make Holmes work hard for the victory, capping a remarkable comeback from health issues. Three years ago, Holmes began to feel dizzy, and he was diagnosed with Chiara malformations and needed brain surgery – twice. If that wasn’t enough, he injured his left elbow from hitting too many golf balls in a rush to return to the tour, and when he broke his ankle while rollerblading for exercise last year, he used that time to have elbow surgery. “It’s been a long journey for me,” said Holmes who in his last six starts, has finished in the top-20 five times. The victory was the third of Holmes’ career and the 500 FedExCup points he earned moved him from 83rd to 18th in the standings. After starting the season on a major medical extension, Sunday’s win gives Holmes exempt status on the PGA Tour through the end of the 2015-16 season. This week Holmes heads to The Players Championship with considerable momentum and confidence. He’s played what is commonly referred to as ‘the 5th major’ seven times and finished 16th or better on four occasions, including a tie for sixth in 2011. Martin Flores finished in third place, two shots off the lead, with Jason Bohn in fourth and Justin Rose fifth. Rory McIlroy, who recovered from a dismal 76 on Friday with a 65 on Saturday, signed for a 70 that left him in a share of eighth place. Phil Mickelson watched what Rory McIlroy did with a 65 early Saturday morning before shooting a 63 and narrowly missed breaking a course record (62) shared by McIlroy (2010) and Brendon de Jonge on Friday. Mickelson shot a 29 for the opening nine and was staring down a 59, but it would not to be for the world number eight. The American would eventually finish in a tie for 11th after a final round of 76, his highest final round on the PGA Tour since The Barclays in 2012. And it was an old nemesis, short putts, that undid him. Mickelson three-putted from 15 feet on the 8th. He missed a 3-foot par putt on the 11th, a 4-foot birdie putt on the 14th and four-putted from 30 feet on the 16th. Geoff Ogilvy was the best of the Aussies finishing in a tie for 14th at 6-under, eight shots from Holmes.